Northern Lights Pinball are pleased to announce our return to Manchester on the Bank Holiday weekend of Saturday the 4th & Sunday the 5th of May at Manchester Central Convention Complex (previously G-Mex). 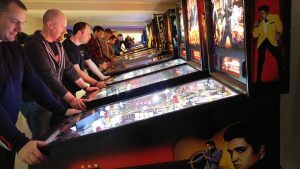 This is our 8th consecutive year of co-hosting with the popular Play Expo, an event dedicated to pinball, arcade, indie and retro games. 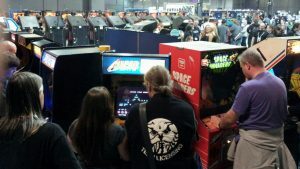 We’ll have over 60 pinball machines on free-play amongst the usual selection of hundreds of classic arcade cabinets, retro consoles, vintage computers, Cosplay, board gaming and much much more. This year’s show in the very heart of Manchester offers fantastic transport links, a wealth of accommodation options and a vibrant night life. We look forward to seeing our friends, old and new at this exciting new venue! By Train – Rail is an excellent option for travelling to Manchester Central. The convention complex is just a 5 minute walk from Deansgate or Oxford Road station, or a 20 minute walk from Manchester Piccadilly. The Metrolink at St Peters Square is also just a few minutes walk away. By Car – There are large 24 hour NCP car parks under and adjacent to the venue. For sat-nav directly to the venue, use postcode M2 3GX. By Bus – A free bus service runs through central Manchester, with stops at St Peters Square just a few minutes walk away. There are a wealth of accommodation options nearby. The venue website has a good selection of recommendations.